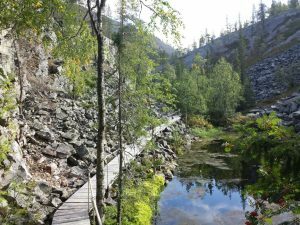 Hiking along Finland’s deepest gorge to the Holy baptism – Pyhänkaste waterfalls provide unique and unforgettable experience. The steep walls of the gorge rise up to 220 meters and at the bottom of the gorge the nature is rich and inhabited by various bird species. The Big Gorge Isokuru is about 2.5 billion years old, and several Ice ages have shaped the rugged landscape. During the hike you will hear geological history of the area, as well as the nature and history of the Sámi people.